My husband and I met in high school. Our circles overlapped, but we weren’t close friends and we never dated. He would tell you he wasn’t ready for me, yet. I’m not sure what that means, but I’ve decided to take it as a compliment. Home from college one summer, I ran into him at his job and he asked me out. I was flattered, but involved with someone else at the time. The next summer, I saw him again. I was working as a lifeguard at a nearby pool and invited him to come by for a swim. Again, I was dating someone else, but I thought we could be friends. A few nights later he stopped by my house when my boyfriend visiting. It was a nice evening, but a bit awkward. Finally, I figured it out. I wanted to see him. I knew I couldn’t count on just running in to him again, but it was an era when women did not ask men out. I had to come up with a plan. Back in high school, my girlfriend dated one of his good friends. Senior year, she borrowed my typewriter so her boyfriend could type his term paper. 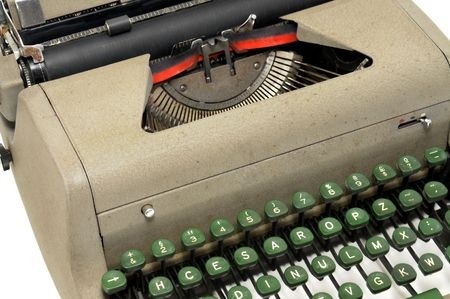 (Typewriters were what we used to type papers before computers.) They broke up and I never got my typewriter back. I decided to ask the target of my interest if he might be able to retrieve my typewriter for me. I’ll admit it was lame, but I thought it was good enough to suffice. I knew he was interested. He’d asked me out twice already. The only real obstacles were my reluctance to ask him out and the possibility that he was dating someone else. I found his number in the telephone book, but it took me a few days to work up the courage to make the call. (Telephone books were what we used to find phone numbers before the internet and cell phones.) He took the bait and we set up a time to get together. I’m sure he saw through my ruse and it was almost a year before I actually got my typewriter back. That was probably his part of the plan. The rest is history. Eventually, I talked him into marrying me. Oh, wait! That’s another blog for another day. This entry was posted in Family, Love, Memoir, Memories, Personal History, Stories. Bookmark the permalink.